Complete the form below to be sent your insured (up to £20,000) FREEPOST Watch Repair Envelope. Repeaters are wonderful pocket watches with a beautiful sounding repeating mechanism. Repeater pocket watches are great collectors’ items with their intricate workings showcasing the feat of fine watchmaking. We are dedicated to the preservation of the delicate workings of these fine pocket watches and we are always delighted when we get one of these fine watches into our repair workshop. At W.E. Clark we’ve made it our speciality to restore antique pocket watches. That’s why we have our own on-site Master Watchmaker. We are passionate about antique repeater pocket watch refurbishment and we’re dedicated to preserving the fine details of these amazing timepieces. The restoration and repair of repeater movement watches is our speciality. We possess a vast knowledge in the workings of repeater pocket watches and we use this to ensure the integrity of any timepiece we work on is retained. Our Master Watchmaker is an expert at vintage repeater pocket watch repair and refurbishment. As well as repairs and extensive restorations, our Master Watchmaker can change the pace of your repeater, making it faster or slower. Whether your repeater is a minute, half-quarter or a decimal type, our Master Watchmaker will bring the mechanism back to life. Repeater pocket watches are extremely complex designs and require an exceptionally gifted hand to carry out successful repairs. Our Master Watchmaker has repaired and restored many repeater movement pocket watches which haven’t been successfully repaired by other watchmakers. We are proud that our Master Watchmaker is one of the very best. Our sensitive approach to repeater refurbishment ensures the correct level of restoration is always applied. Our ultimate aim is to keep all original parts intact, but if a replacement part is required, our Master Watchmaker can hand-make the required part, such is his expertise. Your antique repeater pocket watch couldn’t be in safer hands. 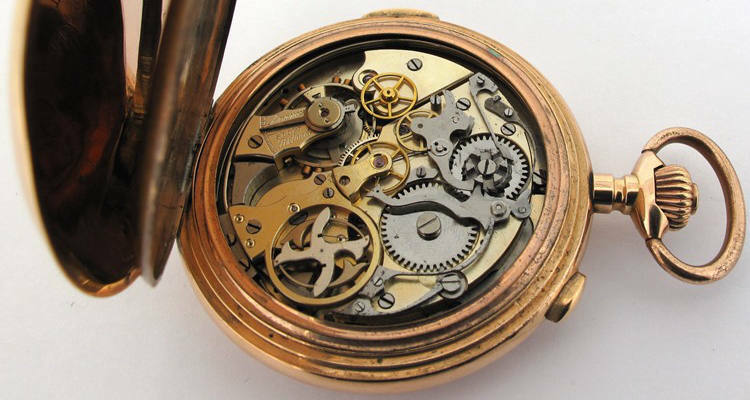 Use our antique repeater repair service and we promise you won’t be disappointed. In fact, we know you will be delighted. Your repeater pocket watch is safe with us from start to finish. We will carry out every vintage repeater repair or restoration with the utmost sensitivity and expertise. We are confident you will be delighted with the results, but for peace of mind we offer a minimum 12 month guarantee for all work undertaken. We know you will be delighted with our repeater pocket watch service. You can ship your timepiece to us from anywhere in the UK using our Royal Mail Special Delivery FREEPOST service. Your repeater pocket watch is insured for up to £20,000 throughout its postal journey, from the moment the package leaves your hand to when it is posted back to you. Before we commence any work, we will discuss any repairs and costs with your first. Antique repeater pocket watch repair with W.E. Clark couldn’t be easier. We would love to repair any repeater pocket watch from around the world. Outside of the UK you will have to organise shipping, other than that you can expect the same exceptional repair service. Feel free to bring your timepiece into our Lewes showroom. We would love to meet you and discuss your vintage pocket watch repair requirements with you. Please do not hesitate to contact us with any queries regarding our service, or fill in the FREEPOST Envelope Request Form.